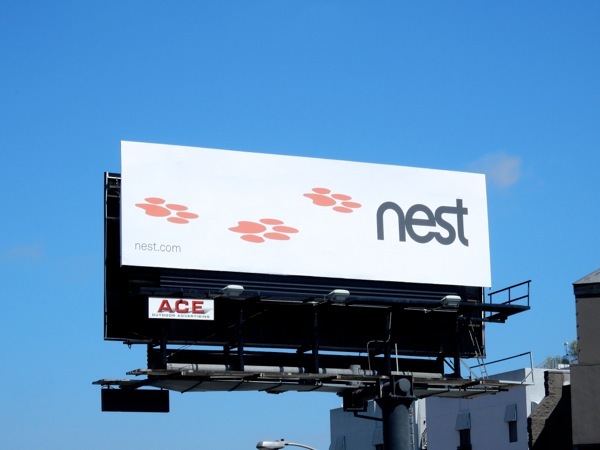 Have you ever wondered what your dog or cat gets up to when you're not home? 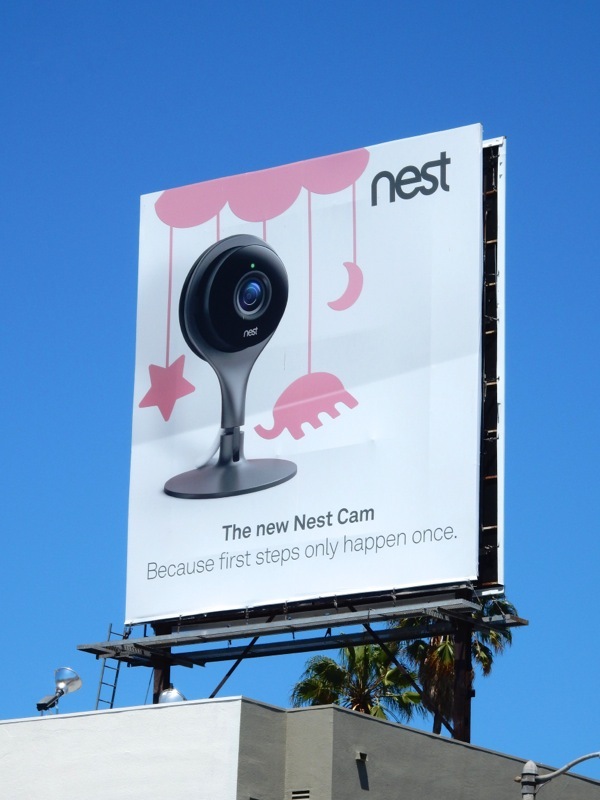 Next year's new animated movie, The Secret Life of Pets, may help explain things, but if you can't wait that long, maybe you need a new Nest Cam. If you ever come home to find a mess of shredded toys, clothes and furniture, or paw prints from spilled food and liquids, now you'll be able to find out who the culprit is, or better yet keep an eye on them all day to make sure they're not getting up to mischief. 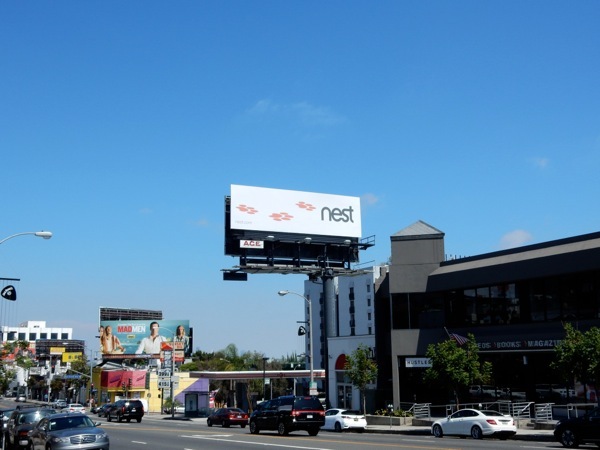 This duo of interconnected billboards along the Sunset Strip in West Hollywood helps convey the benefits of the new Nest video streaming device in a fun way, whether it's to keep your home or family safe. 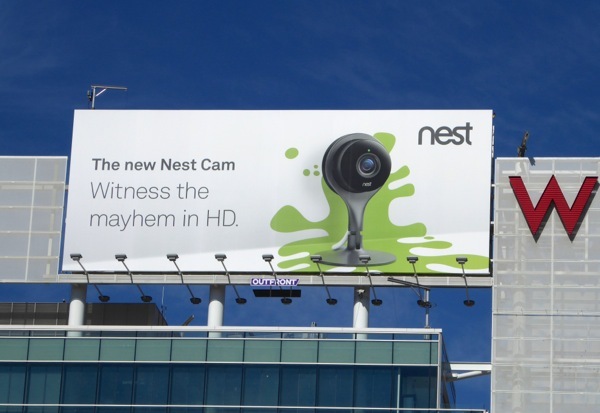 Plus it also comes with Night Vision capabilities in case of things that go bump in the night. 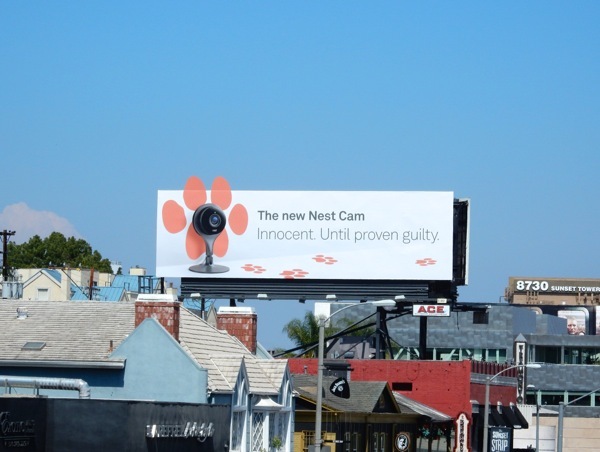 This Nest Cam special extension billboard with its continuing paw print design on the opposite side of Sunset Boulevard (which is part of a wider outdoor ad campaign) was snapped on July 5, 2015. 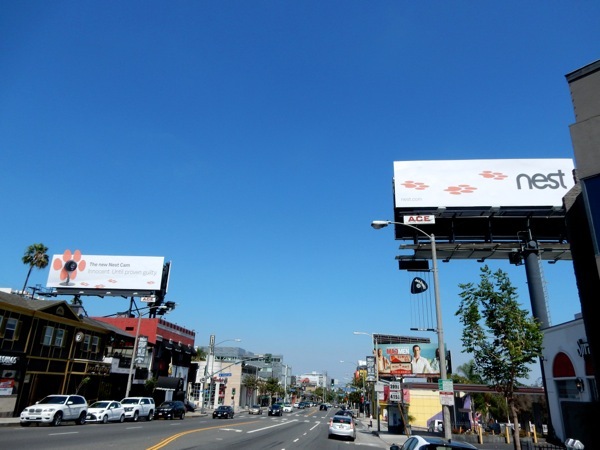 For more examples of this clever two-part billboard installation, be sure to check out this JCPenney billboard example, these season one billboards for The Bridge TV series and these Google Play music billboards (and no, Daily Billboard isn't on commission, but will gladly accept it). 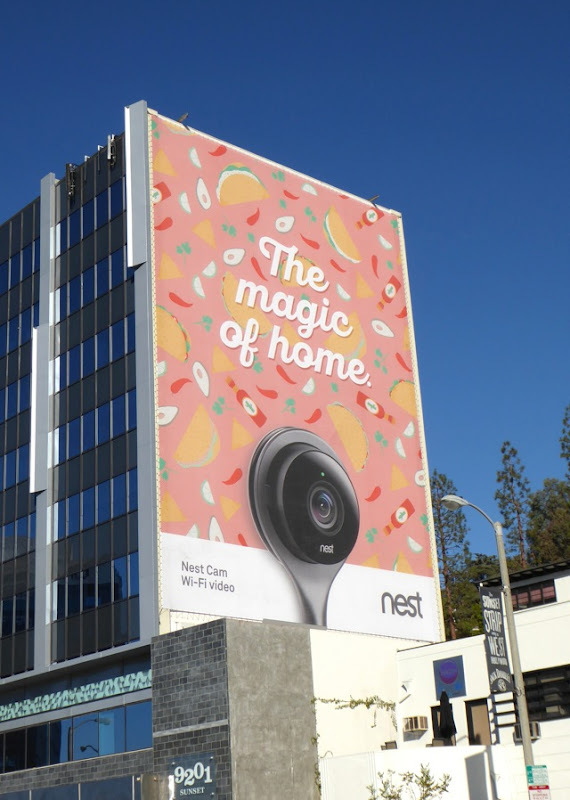 UPDATED: Here's another single creative with a baby crib mobile theme helping to convey the multiple uses for Nest's 'nanny cam'. 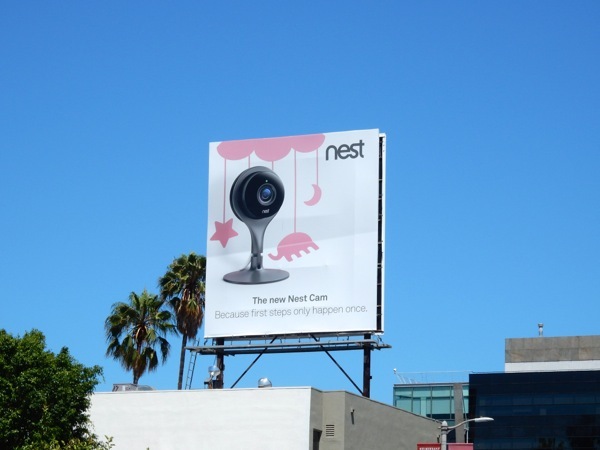 This square ad version was spied along Beverly Boulevard on July 24, 2015. 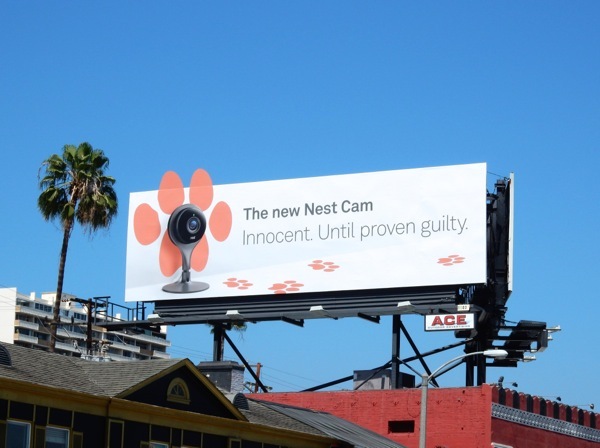 UPDATED: Here's another fun billboard for the Nest Cam, this one with a sporty broken window 'Know whodunnit' theme, snapped along Robertson Boulevard on August 8, 2015. 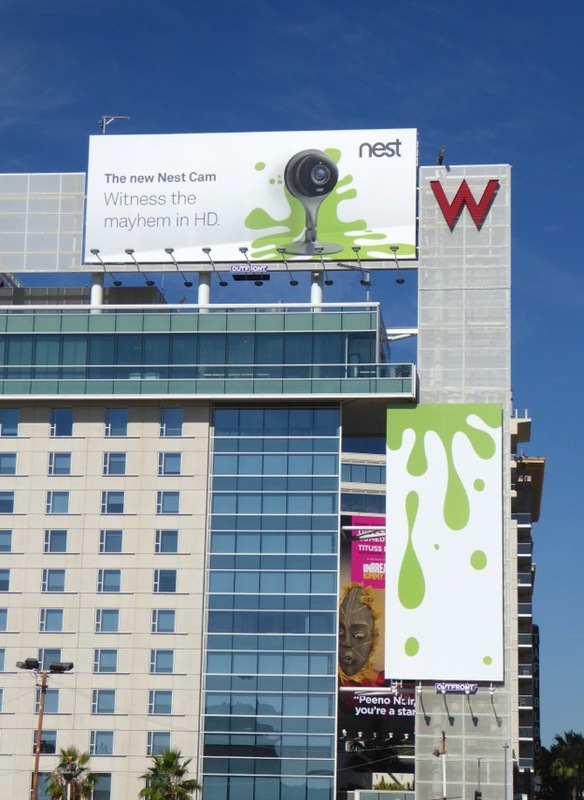 UPDATED: In addition here's another clever creative in a unique ad location on the side of the W Hotel in Hollywood. 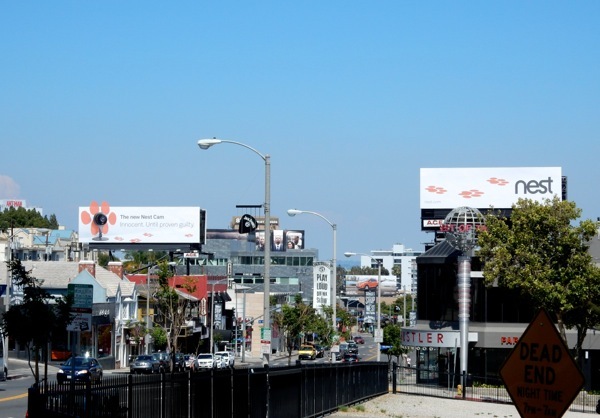 This 'Witness the mayhem in HD' billboard was snapped high above Hollywood Boulevard on August 16, 2015. 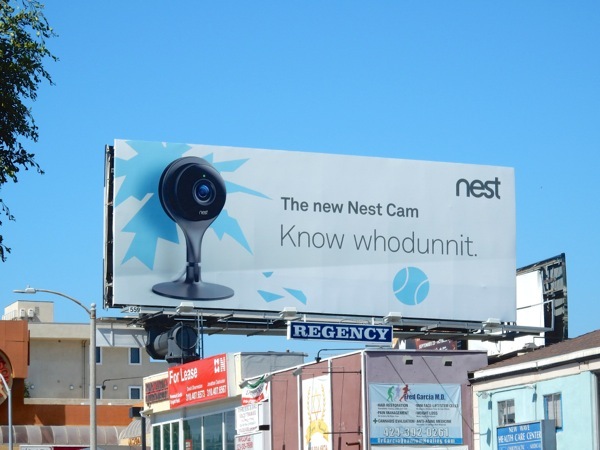 UPDATED: Here's also the follow-up ad creative for the Nest Cam, perfectly timed before the gift-giving season. 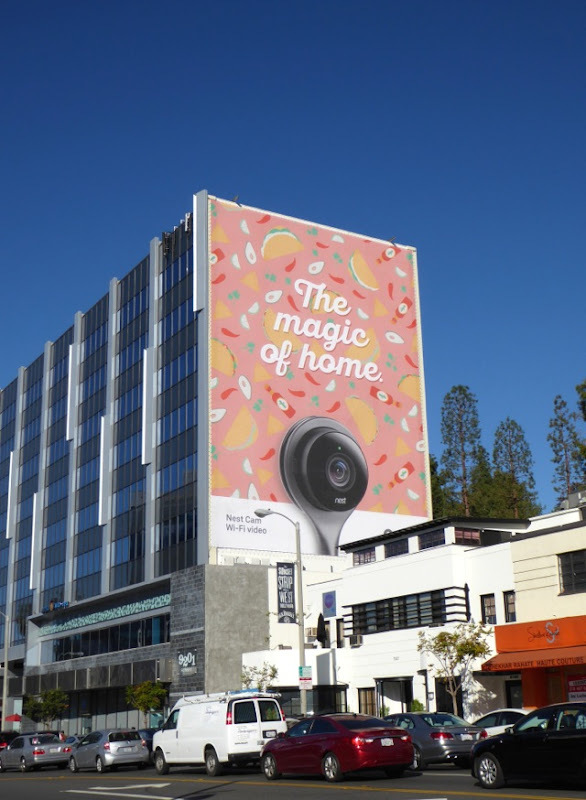 This giant-sized 'The magic of home' billboard was snapped along West Hollywood's busy Sunset Strip on November 11, 2015.